Editors Note: There are spoilers below so if you haven’t watched Sleepaway Camp give your head a shake and stop reading this before you ruin it. You’ve been warned! 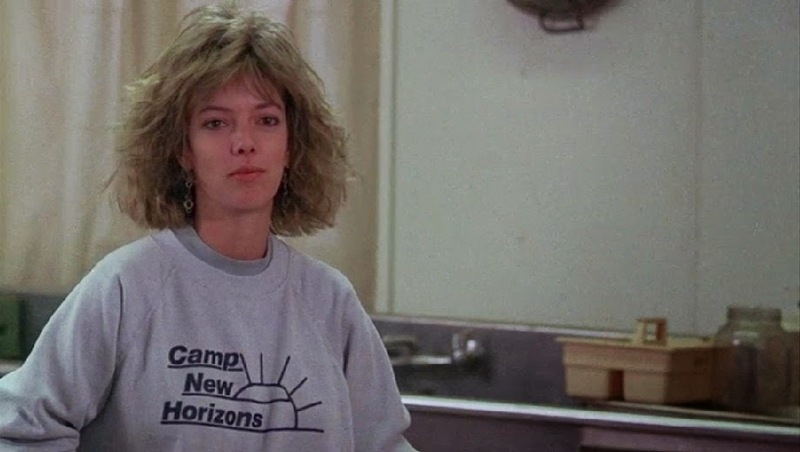 Before Jason and mommy dearest ever laid a hand on a single camper there was Angela and the Sleepaway Camp franchise. While it failed to reach the universal appeal that Friday the 13th had; it was a true originator in the teen-camp slasher genre that birthed many other films of similar nature. As Sleepaway Camp is nearing its 35 year anniversary and has entered the realm of b-list cult classics, it has left us reflecting back on the teen slasher series that spawned two sequels and a worldwide following. Felissa Rose plays gentle and shy adolescent introvert Angela Baker. Alongside her cousin Ricky she is sent to summer camp where unfortunately she becomes an easy target for bullies. Angela barely speaks but she smiles politely and minds her own business but is so shy and soft by nature that it isn’t very long into the film before she becomes bullied. It isn’t until a super creepy chef (and child predator) tries to harm her that she has her first kill. From there on the campers (and staff) that bully her or get on her wrong side end up seeing her wrath unfold in complete bloodshed. As the first film plays out she begins to knock off campers and camp counsellors making this instant slasher gold with the unlikely masked mad man actually being a teenage girl that goes on to be the notorious “Angel of Death”. As the series moved from different directors to actors as Pamela Springsteen took on the role of Angela; the trans teen that was once bullied evolves from shy silent girl to sassy mass murderer in the 2nd and 3rd films. She is no longer silent but sings camp jingles and gets creative. Moving away from using archery her weapons of choice range from lawn mowers and porta-pottys (yes it is as bad as it sounds). In an era pre-dating masked madmen and boogey men with clawed hands alike, she became one of the first (if not the very first) female slasher icon. Looking back Sleepaway had a lot of firsts in the horror genre and or was one of the earlier examples of featuring people of colour in horror in main supporting roles. Each film had women co-starring as everything but the helpless victims but full of attitude, strength and were often sarcastic and boisterous. From Angela's eccentric Aunt Martha to the posse of campers in Teenage Wasteland that gave Angela a run for her money; The film featured Black, Asian and Latino characters starring alongside a transwoman as the villain. In the world of horror it still remains a rarity to see women in lead roles, especially women of colour which Sleepaway Camp series has done decades ago which is still unfortunately something that could use more exposure moving forward in the genre. It isn’t until the end of the films it is revealed that Angela is the killer and even in the 4th unofficial instalment to the series, Angela is still standing. No more is the shy introverted girl but a seasoned psychopathic that goes on the be one of the first and only female slasher characters to date. To check out original Sleepaway Camp designs by GWG click HERE!